I think its fair to say that the evolution of speaker design has lately been directed as much by advances in materials science and improvements in manufacturing processes as by any advances in the science of acoustics. For example, we know that for a dome tweeter to produce clear, undistorted high frequencies, it must move like a piston, such that no part of the dome moves more or less forward or back than any other part. Deviation from this behavior produces distortion. Fortunately, improvements in the use of lightweight, rigid metals such as aluminum, titanium -- and, more recently, beryllium and magnesium -- have helped ensure that distortion artifacts caused by tweeter breakup take place far beyond the audioband (i.e., the audible range). This illustrates an area in which performance limitations are not rooted in a failure to understand how something works, but in finding a means of making it work that way. In the case of the subject of this review, the PSB Synchrony Two B loudspeaker, changes in how the cabinets and drivers are made and what they are made of are key aspects of the continually evolving line of speakers coming out of company founder Paul Bartons workshop. Ive met Paul Barton several times, and have heard him discuss acoustics and his goals in speaker design. Speaking with Barton, Ive gotten a clear sense that not only does he hold those goals firmly in mind, he knows exactly how to achieve them -- no doubt the result of his more than 30 years of experience in designing speakers. One determinant of achieving those goals is the retail price set for each speaker model: the higher the price, the better the parts and materials Barton can use in their design. The Synchrony series of loudspeakers is PSBs second-most-expensive and thus one of their most technically ambitious. (The top of the line is the Platinum series, introduced about five years ago; although PSB hasnt formally said so, the Synchronys seem destined to replace the Platinums. I own a pair of Platinum M2s.) 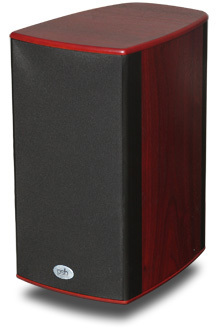 The Two B bookshelf model ($1500 USD per pair) is the least expensive speaker of the seven Synchronys; the most expensive is the floorstanding One ($4500/pair). In between are another bookshelf model, the One B, and another floorstander, the Two. The Synchrony line is rounded out by a surround and two center-channel models. The Two B is a two-way bass-reflex design. Its 1" ferrofluid-cooled, titanium-dome tweeter hands off to a 5.25" mid-woofer at 2.2kHz via fourth-order crossover slopes. Each cabinet measures 13.5"H x 7.5"W x 10.75"D and weighs 16 pounds. As Barton has done with every statement bookshelf speaker since the Stratus Mini, over a decade ago, the midrange/woofer is mounted above the tweeter. Combined with the appropriate crossover design, this ensures that the appropriately summed overall response is at driver height and above, and that any cancellations are directed toward the floor. The Two Bs mid-woofer is made of fine-weave fiberglass and compressed-felted fibers to form a rigid cone thats not only lightweight but self-damping. This, in combination with an oversize voice-coil, is said to maintain magnetic linearity when the speaker is pushed hard, all in an effort to achieve lower distortion. The Synchrony cabinets are another example of Bartons ever-evolving approach to speaker design. When he introduced the Platinum series five years ago, all of the models had cast aluminum tops and bottoms, as well as aluminum faceplates secured by an adhesive to the front baffle to increase rigidity. With the Synchrony series, one could argue that Barton has upped the ante: the front and rear panels are made entirely of extruded aluminum, the curved side panels of seven-ply MDF topped off with a real-wood veneer of dark cherry or black ash. Although you cant see it, the aluminum front panel actually has two layers: the drivers are mounted to the back layer, with an elastomeric material between the layers. The purpose of this is to thoroughly damp vibrations caused by the drivers. Surrounding the drivers and binding to the front panel is a rubbery material that blends nicely with the baffle for a smooth "acoustical" transition, and also hides the driver mounting bolts. Furthermore, the aluminum edges of the front and back baffles are double-locking -- no screws are used to bind the rest of the enclosure to the side panels. Instead, everything more or less slots together, resulting in a supersolid cabinet that feels very dense. Around back, set into the rear panel, are two sets of big binding posts in a vertical alignment. These accept any type of connector, including spade lugs, banana plugs, pins, or bare wire. Although I never needed them -- my speaker cables terminate in banana plugs -- the posts have "wings" that can be hand-tightened to cinch down on the cable for a really solid connection. The inset and vertical alignment also help keep the rear panel narrow, giving the Two B a more graceful, flowing form. And the Two B really does look graceful. With its perforated aluminum grille covering the drivers, it has an understated elegance that should look good in most rooms. I left the grilles on for most of my listening, partly because I preferred their appearance with the grilles in place, and partly because the grilles fit so snugly into the front aluminum corners that it wasnt easy to pry them off with my fingers, indicating to me that Paul Barton designed them to be left on, even for critical listening. The Two Bs claimed frequency response is 50Hz-20kHz, �1.5dB, with a low-frequency cutoff (-10dB) of 40Hz. If accurate, thats impressive extension from a 5.25" driver and a cabinet that could hardly be called large. But part of this must also be due to the Two Bs average sensitivity: 86dB under anechoic conditions. Combined with its nominal impedance of 4 ohms, the Two B will require a few watts to wake it up, though I think any amplifier capable of supplying 50Wpc or thereabouts should be more than enough to play it pretty loud. I set up the Synchrony Two Bs in the system that normally includes my reference speakers of the last two years, PSBs own Platinum M2s. This system also comprises a Bryston B100-SST integrated amplifier with onboard moving-magnet phono stage and DAC, and an NAD C542 CD player used as a transport. Speaker cables were AudioQuest Type 4s. 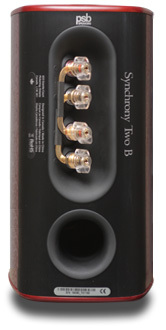 Connecting the NAD to the Brystons onboard DAC was an AMX Optimum AVC-31 coaxial digital cable. I also have a Thorens TD160HD turntable with TP250 tonearm (a modified Rega RB250) and a Dynavector 10x5 high-output moving-coil cartridge. AMX cables connected the Thorens to the Bryston. The Two Bs took up residence close to the spots normally inhabited by the M2s: about 30" from the front wall and 25" from the sidewalls. This left the speakers 6 apart and 8 from my listening chair. I toed each speaker in slightly so that the drivers crossed just behind my head. In this position, the Two Bs created a wide soundstage with excellent center fill. Paul Bartons newest, smallest bookshelf speaker sounded big enough to fill my room. In fact, my admiration of the Synchrony Two B was due in no small part to its amazing ability to sound huge despite its relatively small size. If you dont require chest-thumping bass -- even if its not ultradeep bass but, rather, tunefully tight and moderately deep bass, as youll find out -- you should have no problem with these in even a medium-size room; the Two B was capable of quite high output levels. Not only did the Two B produce plenty of bass for a smallish speaker with a 5.25" woofer, that bass was tight. I first noted the Two Bs surprising solidity down low while listening to Elliott Smiths From a Basement on the Hill [LP, Anti- 86741-1]. Although the bass didnt plumb the lowest depths, it was tight, controlled, and clear, with weight I could easily feel. During "Videotape," from Radioheads In Rainbows [CD, TBD TBD0001], the superb impact in the lowest registers of Thom Yorkes piano gave the instrument wonderful presence in the room, and really brought the performance to life. Toward the end of "2:45am," from Elliott Smiths Either/Or [LP, Kill Rock Stars KRS 269], when the kick drum enters, its thump was rendered with impressive punch, sounding as clean and controlled as Ive heard it through any speaker. Granted, it didnt have the same fullness as through my reference, the Platinum M2, which has a 6.5" mid-woofer and a much larger cabinet, but the quality was every bit as good, and I never found myself missing anything. The same was true when I listened to Nirvana perform with the Meat Puppets on Unplugged in New York City [LP, Geffen 424 727-1]. Cris Kirkwoods bass guitar never went as deep as Ive heard it do through bigger speakers, but it was so clear and so surprisingly full that, instead of focusing on those few missing hertz at the bottom, I found myself admiring the quality of what I was hearing. I never expected a speaker as small as the Two B to sound so full in the lower registers. But delivering tight, relatively deep bass wasnt the only thing the Two Bs did well. As mentioned above, they sounded bigger than their size had led me to expect. There were times when, if I closed my eyes, I could have sworn I was listening to large floorstanding speakers -- such as the Axiom M60 v2s, which I reviewed a couple of months ago. This was definitely the case when I listened to "The Biggest Lie," from Elliot Smith [LP, Kill Rock Stars KRS 246]: the Two Bs created an enormous wall of sound in front of me that was nothing less than astonishing. The clarity I noted in the bass was just as noticeable through the midrange and into the highs. No doubt about it: The Two B was an exceptionally clean-sounding speaker. Voices were outstanding -- the openness and transparency of the midrange helped provide a sense of space around singers, making it extremely easy to hear the subtlest nuances of their vocalizing. This clarity also revealed a greater degree of expression in sung lyrics that was highly involving, and caused me on several occasions to stop scribbling listening notes and focus on music. As with its midrange performance, I found very little to criticize about the Two Bs treble. The highs were extended and smooth and very detailed, though not to the point of being over analytical. Like every other PSB speaker Ive heard (and Ive heard quite a few now), the Two B sounded neutral: If a recording was inherently bright, thats how it sounded through the Two Bs. Case in point: Velvet Undergrounds first album, The Velvet Underground & Nico [CD, Verve 823 290-2]. I wouldnt say this disc is horribly recorded, but its a mixed bag. On a few tracks, the electric guitars sound bright enough that I have to turn down the volume to remove some of their harsh edge. On "Heroin," Lou Reeds voice is so far down in the mix at one point that its almost drowned out by the guitars and drums. The Two Bs didnt tame the screech of the guitars or make Reeds lyrics any easier to discern; they just played back exactly whats on the disc. You cant ask for more than that from a pair of high-quality bookshelf speakers. Finally, as already mentioned, another of the Two Bs strengths was its ability to play impressively loud. This shouldnt be overlooked -- some people like to play their music quite loud, and/or use their music-system speakers for home theater as well. So I played some hip-hop. Through the Two Bs, Talib Kweli and DJ Hi-Teks "This Means You," from Reflection Eternal/Train of Thought [CD, Rawkus/UMVD 112923], only sounded better as I turned up the volume. Most speakers will start to sound hard or distorted once youve passed their level of maximum output -- any further cranking of the volume knob makes thing only messier, not louder. The Two Bs maintained remarkable composure and poise, remaining unflappable at the highest decibel levels I could tolerate. This also served classical music well; after all, reproducing huge dynamic shifts without strain is imperative if you want to re-create the power of a full symphony orchestra. I can imagine the Two Bs would do quite well as the main speakers of a small-to-medium-size home-theater system, provided theyre augmented with a subwoofer. I compared the Two Bs with my Platinum M2 bookshelf speakers, which retail for $2000/pair. The M2 is stockier, tipping the scales at 30 pounds -- almost twice the weight of the Two B. 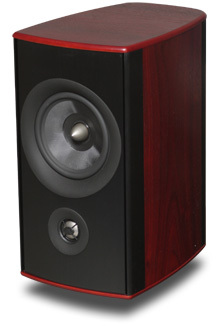 The M2 has a larger cabinet, and a 6.5" mid-woofer instead of the Two Bs 5.25" cone. In terms of appearance, the M2 is far more conventional, with flat side and rear panels and sharp edges. In contrast, all of the Two Bs edges are rounded, and the curvature of its cabinet gives it a very chic look. Also, whereas the M2s top and bottom aluminum plates extend slightly over the cabinet, the Two Bs front and rear panels of extruded aluminum are perfectly flush with the wood side panels. Overall, while the M2 is handsome, the Two B has a (smooth) edge in appearance -- especially as its sleek profile helped it to disappear into my room a bit better. Both speakers are well made. However, when I rapped my knuckles on the cabinet sides, the Two B sounded deader, which suggests to me that its more solidly built. It seems as if Paul Bartons new cabinet design has elevated the quality of the Synchrony series beyond that of his Platinum models. In terms of sound, the Two B was similar to the M2 in its ability to unveil subtle musical details. And while both models are what I consider to be exceptionally clean-sounding, after going back and forth between them several times, I give the nod to the Two B in this regard -- I could hear plenty of detail through both pairs of speakers, but through the Two Bs, these details were a touch easier to decipher. A more noticeable difference between the Synchrony and Platinum bookshelf models was in the sense of scale they brought to music. Ive lavished a lot of praise on the Two Bs for their remarkable ability to sound big, and they deserve every bit of it. But there was no denying that the M2s brought an even greater sense of space and fullness to music. This was definitely the case with "Hunter," from Portisheads Third [LP, Island 1764104]: the reverberation of Beth Gibbons voice made the song sound even more cavernous through the M2s than it had through the Two Bs, and produced a denser envelope of sound. In this regard, the M2 was significantly better. On the other hand, this was hardly unexpected: The Platinum M2 has a bigger mid-woofer and a bigger cabinet, which usually mean greater bass extension and higher output. Probably a better comparison would have been with the Synchrony One B ($2000/pair), which has a bigger cabinet than the Two B, a 6.5" mid-woofer, and costs the same as the M2s. Its been over three decades since Paul Barton began building loudspeakers, and he shows no sign of running out of new ideas. With the Synchrony series, he has again raised the performance bar by implementing several key changes in cabinet design and driver mounting, as well as the materials used to build those drivers. From what Ive heard of the Two B, the Synchrony series comprises his best work yet. While not inexpensive, the Synchrony Two B exhibits levels of build and finish quality that put them several steps above lower-priced, entry-level speakers, and it has sound quality to match. When you consider that the Two B is built even more solidly than the companys Platinum M2 (which costs $500 more per pair), and in some ways sounds as good as or better than the M2, theres no question that the Two B should be considered something of a bargain in the upper end of two-way, stand-mounted speaker designs. If youre in the market for a super-high-quality, stand-mounted speaker, I think youll be as impressed as I was by the sound that emerges from the stunning little Synchrony Two Bs.